The house I bought was in bad shape and I was thinking to either flip it or rent it out. The original bathroom broke down to the slab of the house. Everything was gone and it needed a full bathroom. Then, I searched on the web and narrowed down the remodeling companies. I solicited from Luxury Bath and gave them an idea of what I wanted. They gave me the prices and came up to see the house. They remodeled the whole bathroom, the shower was brand-new. We had Luxury Bath remodel our bathroom. The work was completed in April and from beginning to end, their people made the difference. Their installers were superb, and the project manager, was very attentive. My wife was happy with the project, so I was happy. Luxury Bath was at a show at the fairgrounds and we liked their plan. We got a new shower assembly from them almost two years ago. The installation team cleaned up and did a good job. The quality of work was very good and we were well-satisfied with our experience with Luxury Bath. I spoke with Luxury Bath and they gave me a good, fair price. I had a very good interaction with their representative. They were very professional. The installation crew was very cooperative to our plumbing needs. 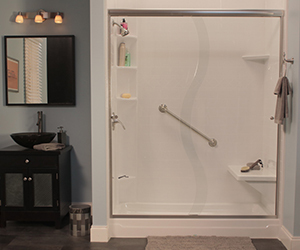 We remodeled two bathrooms which included a shower installation, a new tub, vanity and master bath. Luxury Bath's quality of work was very good. There were a couple of minor problems that I found but they corrected them right away. We saw Luxury Bath online and it seemed like a good company. Our bathroom was built in ’54 and it needed to be updated. We purchased a shower and walls and our interactions with the sales representatives were fine. The installation team that came were great and they finished the three-day job in one day. It was really nice. The bathroom met our expectations. They remodeled our bathroom and their work is immaculate, our house looks amazing! There were no surprise charges at the end, and unexpected issues that arose during the process were handled expertly and quickly. I would recommend them in a heartbeat! Luxury Bath did a great job with my new shower. There were a few issues with scheduling but that could happen with anything. The quality of work was outstanding. Any problems I found were quickly addressed & resolved. There were some issues with the doors & water splashing on the floor. The Owner worked with me as well as the manufacturer & this was also resolved. Would recommend to others.